– First allowance race appearance. MARYJEAN finishes 3rd. As soon as we get the final vet bill we will post the final financial spreadsheet and breakdown the return even further. Look for an announcement on the 2015 Club shortly. Those of you that have expressed interest in the Alumni Club will be getting an email update this weekend. I have received 43 inquiries so even if everyone doesn’t decide to join, I think we’ll have enough to move this group forward! Here is the Q&A that came through with folks looking at the “intermediate” group. These seemed to be consensus of most questions. If you have additional questions, please put them in the comments section and we’ll use this thread to get as much accomplished as we can. How are any profits distributed? Yes, I boiled this one down a bit and blunted it, but that’s the essence. After the first three months, the goal is to have 3 months expenses in the bank with any excess amount going out to a vote of the group with the following options: just leave it in the bank; look for another horse; distribute it in the form of dividends back to the members (again, leaving 3 months expenses in the bank). Not to beat this to death, but while we are going to strive to make a profit I hope you all know now how difficult that is and that it is far from guaranteed. As long as it takes. There are no barriers to this group. The LLC will last as long as we are willing to run horses. Every time we are horseless we will re-evaluate and folks will have the opportunity of getting out and, possibly, coming in – or disbanding altogether; this will be part of a group discussion. Unlike the Racing Club, this is an ongoing obligation and, should things go south, we can’t just throw up our hands and walk away. We’re legally obligated for our share of expenses. If in a year you decide that this isn’t for you, you can sell your share if you’d like but who you sell to would have to sign the group contract. In the past with some of my other groups, when we become horseless is the time to evaluate who wants to stay in and who wants out. At that point, with all the obligations of the group paid, if a few want to walk away (and others may want to join), then that is the perfect time to do so. In all honesty, what we’ve seen through experience is the world wants to join when things are going well and no one wants to pay the bill if things aren’t going well. I like to tell people to go in planning on never winning a race and be delighted when we do. Keep in mind also that we will be running horses where they belong and that a claim isn’t a bad thing – we won’t be keeping bad horses forever. You need to talk to your accountant. Every year members will get a K-1 showing profit or loss of the year’s activities. How that affects your individual tax scenario, I do not know. Everyday decisions will be made by Clay and I. If we get an offer to buy a horse we own, that will go out to the group in the form of a poll. Voting will be of short duration, usually 24-hours because time is usually of the essence, so watch your inboxes. There may be the opportunity to discuss potential claims or private purchases through the forum as well depending upon time. However there is virtually no way to achieve consensus on 50 individuals, though a clear majority will rule. In close situations, Clay and I will decide. Will members need to get licensed? If the group fills to its 50 member limit, then each member will have a 2% ownership stake, under the 5% threshold to be licensed in MN and IL. However I will check with the Commission and see, for those of you that want to be, if you are still allowed to be licensed if you own under the threshold. Licensing fees are $50 for the license plus fingerprinting ($21.50 to run the prints) and are the responsibility of the member. The licensing of the group is paid for by the group. How much extra could we have to pay? As I hope you all know at this point, this can vary. There are vet bills, farrier, shipping, training etc. I think over the course of the year we factor in $2,600 a month for expenses, that’s probably close. How quickly we do or don’t run out of money is contingent on the success we have on the racetrack. One other thing to remember, if the group fills everyone will be 2% owners. Up considerably from the .05% of the Canterbury Club but, looking at $4750 a month in bills for 2 horses ($14,250 for 3 months) then the average liability per member (estimated), if there are absolutely zero earnings during that period, is $285 every 3 months. We will race in Minnesota and Illinois – we will follow Clay. I hope that this helps somewhat. It may end up generating more questions, and that’s okay too. Just lay them out there and we’ll get ’em answered! As you all know, the Club is ginormous – which is a very good thing, I think! We try and keep the Club’s focus on the educational aspect of racing, giving everyone the ability to “pull back the curtain” on horse racing and, hopefully, having some fun doing it. One thing I think we’ve all noticed is that there are folks who would like to step up to the next level: the ability to carry horses over from season to season; maybe buy a better horse and run at higher levels; having a profit motive, among other things. The problem, I think, is that the next step is a smaller racing partnership that offers folks entry at $2000 or $2500 – quite a leap from the $250 buy in now for the Club. I’m thinking of offering a special partnership group ONLY for folks that have been in the Club. This would be an “intermediate” group, if you will. The buy in will be less than a ‘regular’ partnership (though higher than the base Club), there will still be free admission for the members and, if I can arrange it, discount winners’ circle photos (should we be lucky enough to win) and a meeting location to watch the races (when available). There will also be an attempt to make money for the members so there will be tax consequences from year to year as well as a downside risk – the track will not be the safety net for this group. If the group looks at a deficit, members will be billed for the cost. Group communication will be handled through a private Yahoo! group that will be specifically for the group only as opposed to the open blog for the Club. While we will be running the Club via GRS, ownership will not be under Grevelis Racing but under the group name as a separate ownership entity. We will be looking to either claim or privately purchase a horse with Clay and, if the group is filled up, we would look at possibly two horses around the $15,000 price point or a single horse that might be closer to $25,000 that we can hopefully compete at a higher level. The Canterbury Racing Club and it’s parameters and primary mission will still exist and, hopefully, continue to be popular with fans. This is designed for folks that may be ready to move on but not quite ready to jump in THAT deeply. I’d like those folks that are interested to email me at ted@grevelisracing.com and let me know. Obviously if the interest isn’t there we won’t go forward with this but it seems to be the right time to offer a group like this. This way I can get a head count and we can determine if we will move forward with the group. Here are a couple of photos from Terice’s win courtesy of Ron and Cheri Jacobson who made the trip and got in the winners’ circle photo! 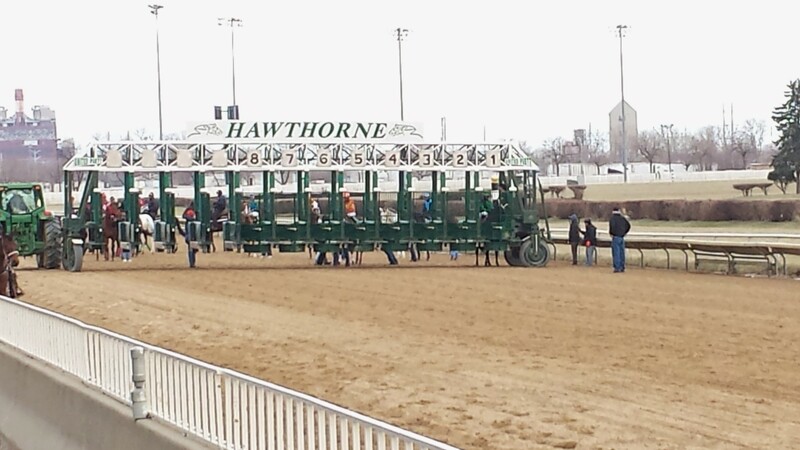 Terice loading in the gate before the big race. Terice did it! She notched her 2nd win in a row and made it 5 in a row for the Club by overcoming a TON of trouble and winning the 5th at Hawthorne under a confident ride by Emmanuel Esquivel. Terice broke well and was carried a bit wide through the first turn, though not outrageously so. She finally settled nicely down the backstretch but found her self boxed in and with nowhere to go as they started to enter the far turn. Esquivel had to check her hard to back her out of trouble and then angle around the traffic just to get her a clear run at the leaders when they straightened for home. Esquivel worked on her nicely through the lane and she responded well closing on and then passing Geneva Lake and holding her at bay through the wire. It was a very confident ride by Emmanuel as he had to have known that he had plenty of horse beneath him. The Jacobson’s were there to represent in the winners’ circle as well! She did get claimed in that race which, as you know, needed to happen so it was a good thing even though it’s tough to see her go. The new trainer is Chuck Turco who hangs his shingle at Canterbury over the summer so we should see her back again in 2015 and, of course, wish her nothing but the best. Congratulations, folks. It was a record breaking year and I’m very happy for you all! Now we will wait for the vet bills and Clay’s last couple of bills and hopefully we will have this all wrapped up with final totals by the 2nd week of January. Details on next year’s Club and a possible new option for Club members coming in a few days. In the meantime, CELEBRATE! TERICE takes the track today at Hawthorne about 2:55 PM CT in the 5th race, a $5000 claiming affair going a mile and 70 yards over the main track. This looks like a stouter group than in her last and while I was hoping that coming right back at this level would get us the claim that we are looking for, there are others in here that seem a bit more likely. 1 Nikaluk (Reavis/Colvin) – Your morning line favorite. Has a pattern I HATE to see when betting a race: a steep class drop after a claim. No one likes to lose money and claiming for $12,500 and running back after a poor effort and 6 week layoff at $5,000 raises too many red flags for me to count. Could be a tweaked ankle and a ploy by the trainer to try and get a quick win before we figure out we were duped, but I’m very suspicious. 2 Cash in a Shoebox (Holder/Thornton) – She hasn’t graduated from the conditioned claiming ranks yet and now steps in against multiple winners. 3 Sweet Jess (Block/Felix) – Won at higher on the turf and also broke her maiden over this racetrack on the dirt. She’s shown good early speed as well as the flexibility to try and close. She would have been my choice for favoritism. 4 Geneva Lake (Rivelli/Sanjur) – An off the pace type whose class level fits very well in here. Beat $10,000 claimers two starts back though faltered at $8,000 in a pace scenario that I would have thought would have been right for her, though it could have been the extra distance. A heated battle up front and she will be dangerous late. 6 Jardenia (Cox/MontalvoCosme) – Won her last in much the same way Terice did, though we came from slightly further back. They bring her right back at this level after the win. She really wasn’t competitive in her races leading up to the win so we’ll have to see if it was a fluke or a turning of the corner. 7 Wildcat Devil (Cristel/Lantz) – While she was second to us last out, it “wasn’t as close as the score indicated,” though it wasn’t a bad effort. Her early speed cold be a real asset for her since the race has scarily little. 8 Wild Luna (Turco/Emigh) – An old friend from Canterbury this summer, she has been thrashed soundly in her last few including by Terice in her last. Our girl won’t be too far off the pace this race, where she does her best running. We’ve seen throughout this streak that Esquivel will put her in the best spot so we know that we’re going to have a chance. I have concerns about the lack of speed in the race. I guess that Sweet Jess could make a go of it early and perhaps Wildcat Devil will go as well, ensuring an honest pace, but that’s an iffy proposition. The upside to me is that there aren’t any in here that are monsters and the couple that may like to run in front aren’t really speedballs. The race could come down to the stalkers that have the best trip that are able to lay closer to an anticipated slower pace and being bale to run late. With Emmanuel, I like our chances but she will have to dig deep to hold off a big class dropper like Sweet Jess. The last two races I felt very confident that we could win ’em pretty easily. For this race, I think we can do it, but it will be anything but easy. MJ made it 3 in a row with a superb effort under another perfect ride by Emmanuel Esquivel. She stalked the speed, Russian Rhapsody beautifully, never letting her get too far away and then powered past her at the top of the lane and cruised on to win by 2. 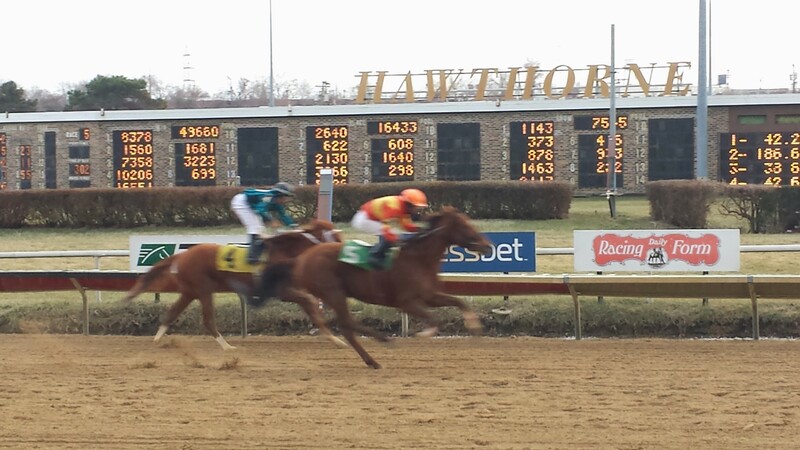 An excellent job by Clay to keep her sharp for this long (she hasn’t been out of the exacta in months). She was claimed out of the race, which was the purpose for keeping her at this level for so long. I honestly thought we would have lost her after the last race so it was nice to get a little bonus out of the deal. TERICE goes in the 5th race on Saturday, a $5000 claiming race going a mile and 70 – basically the same as her last as well. We will try and extend the Club record for consecutive wins and wins in a season with that one, too! And yes, Emmanuel is aboard once again.